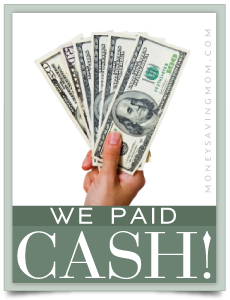 Share Your "We Paid Cash" Stories! As you know, I am passionate about staying out of debt and living within your means and I think it’s especially encouraging to hear personal stories from people who are choosing to be counter-cultural and pay cash, instead of credit. I’d like to start highlighting stories from you, my readers, right here on December212012®! Have you saved up and paid cash for something recently — like an appliance, furniture or a car? I’d love to hear your story! And your story might just end up as part of the new “We Paid Cash” feature we’re rolling out in the next few weeks. To keep things fun, I’m going to say purchases made with a credit card (even paid in full), don’t count. 🙂 My goal here is to highlight purchases that involved no borrowing of money at all! Posts must be high-quality, original content (i.e. not published anywhere else online). Include details about how you saved, how long it took, your favorite money-saving tips and any other unique information others might like to hear. Please limit your post to 500 words or less. Use of bullets, lists and short paragraphs is highly encouraged as it makes reading much easier. I’d love to have a relevant photo (of yourself, your family and/or the item you paid cash for) to include. Simply attach it to your submission email. Please make an effort to use correct spelling, grammar and punctuation. Ensure any links in your post are relevant and valid. Include a short bio (1-3 sentences) at the end of your post. Email your post to [email protected] with “We Paid Cash” in the subject line. Please allow 4-6 weeks for your post to be reviewed. I look forward to being inspired! I wanted to share my story on saving. Today my husband and I bought a brand new mattress. We paid for it with money I saved up from taking surveys. It only took maybe 6 months or less. I decided to really put forth the effort to not spend any of my survey money and use it for am emergency fund and or Christmas. My husband had been having neck problems and I have had back problems. We had our old mattress since we were married 15 years ago. His parents bought it for us new as a wedding present, so it was time for a new one. I wanted to share this as proof that taking surveys online can be very beneficial. I do save money as much as possible with coupons (I am a coupon addict), but decided to not spend any of my survey money and when I was tempted to buy the smallest thing I told myself that it would put me behind my goal and I liked seeing the money in my account rather than taking advantage of every single deal I saw or read about on savings blogs I follow. My goal was to have $500 saved from my survey taking before the end of the year, but was going to reach that goal sooner than I thought and we decided to use that money for the mattress. I like the best deal possible so we expected to go in and get a new queen size mattress for the advertised $179, but we ended up getting a better mattress. It was a $650 mattress that we were able to get for $200 off and pay $450 before taxes. I had $486 to put toward the mattress and it only cost us $481 after tax. Sounds way off the goal price, but it was the mattress we decided we both felt comfortable with and I know God had a hand in it since I had enough saved at the exact time we needed it. I just wanted others to know that something as simple as taking surveys in your spare time and resisting the temptation to do every deal you see and remind yourself that the money would be better saved can reap rewards. I know I will be very happy with my efforts when I sleep on my brand new and extremely comfortable mattress that I was able to afford without spending any money from our main checking account which is my husbands paychecks. By the way I am a SAHM so it is rewarding for me to earn from home in my spare time with surveys and rebates and my couponing efforts. I am so thankful that God has blessed us with the things we needed when we needed them.